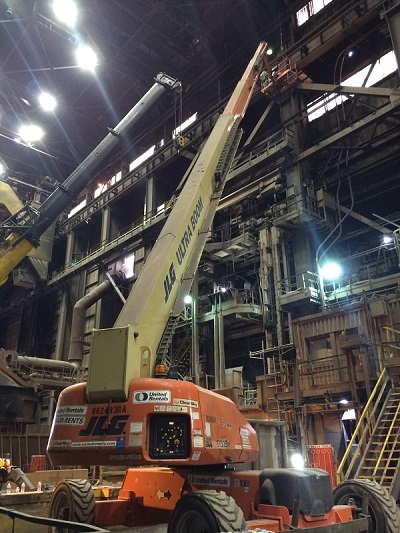 The Pangere Corporation completed the removal and replacement of 33 crane runway girders, all pre-work necessary for the structure to accept the new girder design, and column jacking at ArcelorMittal’s Burns Harbor Basic Oxygen Furnace facility. The project was planned to allow for continued use of the facility during the work, calling for two 25’ girders and one 50’ girder to be replaced during each mobilization. Girder replacements took place in both the ‘charge’ and ‘teeming’ aisles of the facility, creating a unique set of circumstances each time girders were replaced. 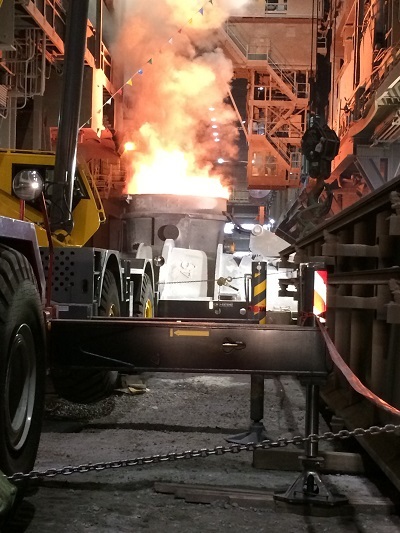 The teeming aisle girder changes occurred in front of three steelmaking vessels and were sequenced to ensure that two of three furnaces could remain operational while Pangere performed the work. Furthermore, each set of girder changes was given a tight window for completion, allowing only 24 or 36 hours depending on the location in the aisle. Once the clock was started, work crews had to stage equipment, cranes, and girders, perform the work, and demobilize to return full production capabilities to the owner. In order to achieve success in the project, Pangere personnel closely monitored a number of factors that were continuously changing as the plant continued operations during the work; ladle transfer cars, overhead crane movements, the use of ladle treatment stations and the vacuum degasser are some of the operations Pangere ironworkers needed to keep in close contact with. In order to effectively monitor these operations, a team of ironworkers dedicated to safety was formed. This team was responsible for communicating overhead crane and production movements and to make sure crews would not be exposed to hot metal splashes or moving equipment. The girder replacement project at ArcelorMittal is a model of what can be achieved through teamwork and co-operation between owners and contractors. The project itself was ambitious in that plant operators wanted to continue production during construction and serves as a model example of how Pangere supervisors effectively plan and respond to make certain even the most challenging customer needs are met. In order to safely accomplish working in a live environment, Pangere and ArcelorMittal teams met consistently to discuss the project and production needs resulting in the formation of plans that would enable plant operations to continue with the least amount of disruption possible. Given a fluctuating environment and the need to be responsive to changing customer needs and schedules, Pangere supervision proactively planned for multiple scenarios so that construction remained efficient and every window of opportunity to complete the project was utilized. This is best illustrated by Pangere completing prep work and planning for girder changes in multiple areas of the facility so that work crews could seamlessly transition from one section to another, avoiding lost time and delays. 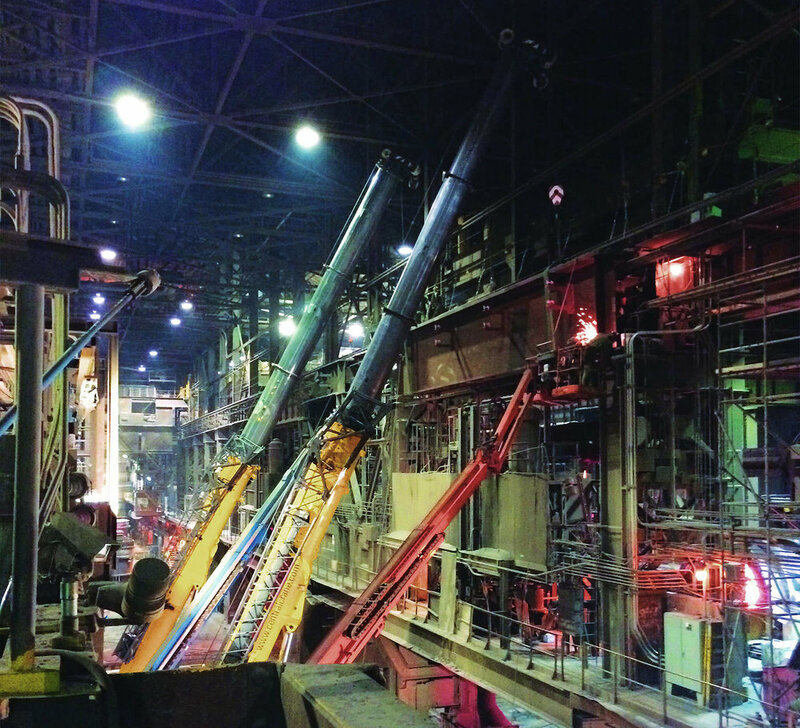 "After each section of girders were replaced, the BOF shop operating management grew more confident in Pangere's performance such that they agreed to allow the final nine (9) girders to be installed during a partial shop outage in October 2014. The BOF crane runway girder replacement project was a huge success due to Pangere's performance. The project was safely completed under budget and ahead of schedule with all new girders properly leveled and aligned."